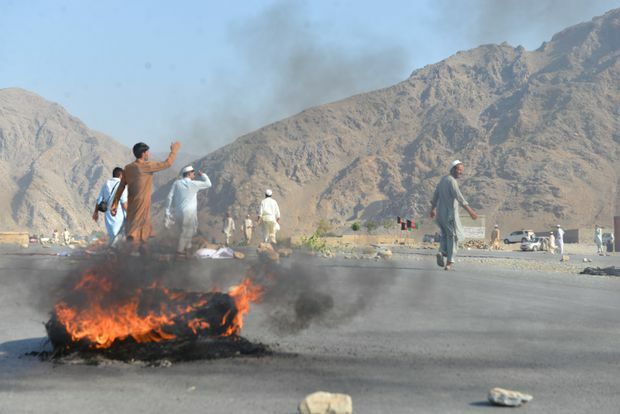 Men shout slogans against terrorists after a suicide attack among the protesters in Momandara district of Nangarhar province, Afghanistan, Sept. 11, 2018. A suicide bomber in Afghanistan killed at least 32 people and wounded more than 120 others at a demonstration on Tuesday on the highway between the eastern city of Jalalabad and the main border crossing into neighbouring Pakistan, officials said. The blast dispersed the crowd, but more people gathered after the explosion to continue the protest. The details of the complaint against the police chief were not immediately clear. There was no immediate claim of responsibility for Tuesday’s attack. The Taliban issued a statement denying involvement. Another official Sohrab Qaderi, a member of the Nangarhar provincial council, said at least 56 bodies were taken to hospital, with 43 more wounded. That higher death toll was not confirmed.